Positive indication of the operation with red colour pop. Low power loss not only saves energy but also ensures cool running and longer life of equipment. Low cut-off current reduces electromagnetic stresses and damage to circuit & equipment. Low I2t let through energy reduces thermal stresses, fire risks and damage to the equipments. Ideally suitable for back up protection to motor starters against short circuit faults. C&S HRC fuse-links have been developed & designed to meet the requirements of modern industrial installations & available in breaking capacity which are sufficient enough to meet the highest short-circuit levels. Selected HRC Fuse Links should have current rating not less than the normal full load current of circuit. 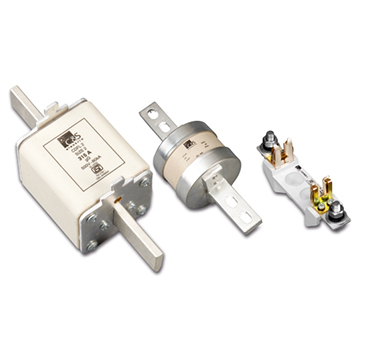 Class ‘gG’ Fuse Links provides complete protection of cables. Breaking capacity of fuse links is 80 kA at 415V & 500V AC.C&S now offers total solution for modern day requirement for measurement, analysis and communications, all in optimized size.Compact yet offering various connections for ease of installation snap on site fit accessories, enhanced life and intuitive operation makes them a very user friendly range of circuit breaker for any application. Sufficient contact pressure is maintained by ring springs throughout life of the base which also does not allow temperature rise to exceed.Contact material is ETP grade copper which is silver plated and hence ensures low temperature rise.Sufficient contact pressure is maintained by ring springs throughout life of the base which also does not allow temperature rise to exceed.Fuse bases are available for all rating of fuse links upto 630A & for voltages upto 500V, 50 Hz.Fuse Holders have been tested at 415V to compliance IEC 269 / IS 13703 and also available in Busbar mounting Type.